If you want to watch some high definition movie trailers at Apple website or download films or movies with .mov file extension in a Windows Vista system, QuickTime Player is required in order to play or view the videos. But apparently the current version of QuickTime, QuickTime 7.1.6 does not support Windows Vista, and will give you plenty of problems although the installation may go smoothly. 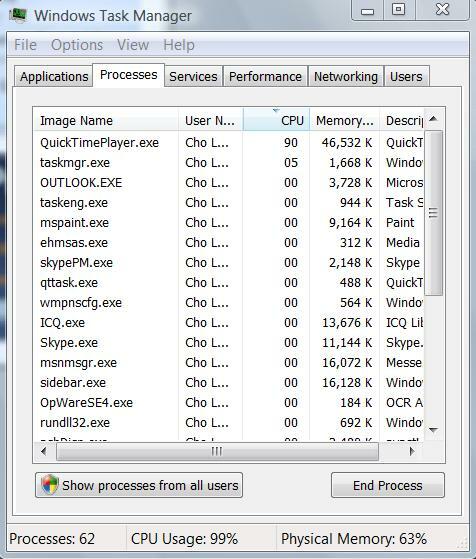 When you run QuickTime Player in Windows Vista, the CPU utilization rate will instantly go up to sky high level, as seen from QuickTimePlayer.exe in Task Manager. So your system will slow down, crawl, and will likely freeze or not responding. A few minutes are needed before your computer can come back from frozen state, if ever. Mind you, that’s before you load or open a high definition video or movie clip with the player, where the instability of the system will get worse. The solution is to dump and do not use the official QuickTime player from Apple at all. If you have installed QuickTime, uninstall it from Control Panel. We have a nice alternative, aptly named QuickTime Alternative, which supports Windows Vista. Download QuickTime Alternative (no longer required). Once installed, your Quicktime movies or .mov video clips will play in Windows Media Player 11 (WMP) instead. The codec driver for the Quicktime Alternative takes only low amount of resource with no background process, so you will see Vista flies when you watch the HD movie. If you not prefer to use WMP11, the install package also comes with an alternative Media Player Classic (MPC), or you can use any player of your choice too.